IN A WORLD where CGI reigns supreme in filmmaking, there’s something wonderfully comforting about the movies made by Britain’s Aardman Studios. The team behind Wallace and Gromit, Shaun the Sheep, and Chicken Run create handmade clay characters that feel real and tactile – you can see the thumbprints on them, and you know they’ve been touched by a human. And with its movies making an average of $163 million a film – and Chicken Run was the highest-grossing stop-motion film of all time – that human touch is what no doubt contributes to Aardman’s success. The latest Aardman film to hit the big screen is Early Man, which reached Irish cinemas yesterday. This time, instead of chickens, sheep or dogs, the studio is telling the story of what happens when cavemen try to save their village with the help of the beautiful game. Yes, this is a film about cavemen playing football. And testament to Aardman’s quirky touch, it just works. It turns out that the inspiration for the subject came to Nick Park, the film’s director, when he was a child. When he was in school, Park even created both a comic story and an 8mm film about a caveman and his pet Brontosaurus. “I remember making everybody laugh when the teacher read it out,” he says of the story. It was when he was doodling a few years ago – “all the ideas start off with simple doodles, really” – that he started drawing a caveman with a club. “And I thought about sport, hitting a ball, and then started to think about maybe sport brought about civilisation and football and the tribal nature of it and it all just developed from there, really,” he says. Park maintains that – though the film is chiefly about football – he “wasn’t trying to make a sports movie really, it was more the caveman aspect and the invention of football”. Park knows a lot about what Hollywood wants. Aardman, which was founded in 1972 and is based in Bristol, was once part of the DreamWorks stable. But after 10 years, their deal was terminated due to creative differences. The New York Times reported at the time that Aardman executives “chafed at the creative control DreamWorks tried to exert”, particularly on the film Flushed Away, though this was from the mouths of unnamed sources. Regardless of what went on, Aardman does feel far away from the Hollywood scene. Yet the characters in Early Man are voiced by big-name actors. Dug is voiced by Oscar-winning Eddie Redmayne, Maisie Williams is soccer star Goona, the fearsome Bronze Age leader Lord Nooth is Tom Hiddleston with a faux-French accent (a behind-the-scenes video shows Park massaging Hiddleston’s back to make sure his voice is perfect during a specific scene). There’s also plenty of other British comedy stars on board, including Rob Brydon, Richard Ayoade, and Johnny Vegas. Park has been steeped in animation since he was a young child, sculpting his first characters out of felt. And in person, you can tell he’s just the patient sort who can handle the fact that you often finish work with just a few seconds of footage recorded every day. Because for him, the joy is clearly in the process. A film of this length – about 90 minutes long – needs over 30 people on over 35 sets. It’s a slow and laborious process (though Park says it’s not boring). Different scenes are shot at the same time, and the level of detail that has to go into each one is remarkable. He wouldn’t want it any other way. Picking up the models of Dug and Hognob which are next to him during the interview, he points out to me that “people would normally avoid the fur and the hair [on these characters] because with this technique the animator is handling and tweaking the character in every frame, and so you get that boil, they call it, the way it twitches and rustles”. “But I like the thumbprints in the clay, I like that because it makes you mindful of how it’s crafted, and that it’s more individual and not produced by a machine. And I think that’s kind of endearing myself,” he says. It’s not about perfection, it’s about trying to be as real as possible. Or as real as you can get with a figure made out of clay. “It has a humanity as well, and like characters like Gromit which I guess you could liken to Hognob, his character came out of clay,” says Park. In fact, things could have been very different had he created this character on a screen. 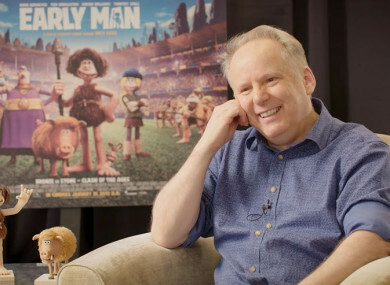 But it’s not as though Aardman shuns technology or CGI altogether – it tries to have a harmonious relationship with it, and there is CG employed gently in the background of Early Man. “We’ve always adapted technology and we’ve always taken on… we’re not stick-in-the-mud, we have had quite big forays into CG as well with Arthur Christmas and Flushed Away but I’ve always stayed with the clay, I just love it,” explains Park. “And it’s our forte as a studio, it’s our signature. I think a few years, 20, 30 years ago we were often thinking ‘our days are over, this is going to be the end of it’. But we’re still here,” he says. At Aardman, they also try to do things their own way when it comes to how they treat their characters and storylines. There’s obviously a quintessential British humour present in all of their work, as well as tons of puns and sight gags (the zebra crossing in Early Man is a prime example of the latter). But there’s also a refreshing lack of ‘sophisticated’ characters going on a ‘journey’. “I remember my colleague Peter Lord saying with Wallace and Gromit, Americans were always asking at the studios, ‘what does Wallace learn? What do the characters learn?’. There’s always got to be something like that, but it’s how it’s done I guess, and I remember Peter saying the thing about Wallace, he never learns anything, that’s what makes him funny,” Park chuckles to himself. Indeed, what us audience members tend to like about Aardman’s characters, be they Shaun or Wallace or Dug, is that they can be refreshingly silly. “They’re affable and they are idiots – but they’re lovable idiots,” says Park. Early Man is in cinemas now. Email “'We think of ourselves as a bit separate to Hollywood': The secrets behind the Wallace & Gromit creators' new movie ”. Feedback on “'We think of ourselves as a bit separate to Hollywood': The secrets behind the Wallace & Gromit creators' new movie ”.